Stéphane Grappelli (26 January 1908 – 1 December 1997) was a French jazz violinist. He was born in Paris, France to a French mother and Italian father. He got into music at a young age. When he was 12 years old, he got his own violin. Later, he met Django Reinhardt. Reinhardt was a guitarist. Together, they founded the Quintette du Hot Club de France. The Rock Peter and the Wolf (1976 RSO Records) (2007 CD Verdant Records) with Jack Lancaster, Phil Collins, Brian Eno, Keith Tippett, Julie Tippetts, Gary Brooker, Gary Moore, Alvin Lee, Manfred Mann etc. ↑ Agha, Yasir. 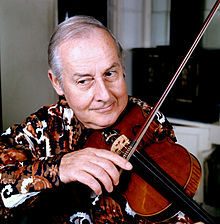 "Stephane Grappelli". Retrieved 25 March 2010. This page was last changed on 19 November 2013, at 08:30.